It's the third Tuesday of the month, and that means Doodle Pantry is having another release day...with .svg cut files in addition to a few new digi sets. 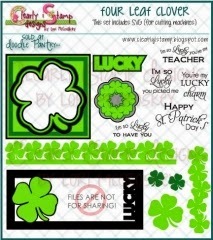 I am using a brand new .svg cut file set called Four Leaf Clover SVG and an older digital set called Irish Birdie. I chose to do the four leaf clover frame. There are 4 layers to this frame and I attached them all to a white card stock base. I pulled the birdie into my Silhouette and traced, print and cut the pre-colored image. I cut all 4 layers using black, lime green and a darker green card stock. (See the post below this one to find out what I did with all the middles from the frame.) 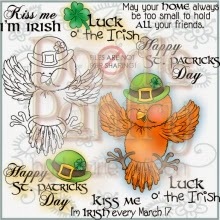 The sentiment is from the Irish Birdie set and was printed on white card stock and layered onto black card stock and popped-up in the corner. I added 2 different sizes of green gemstones into the hearts of the clover. This was a super fun and quick card to make and Laurie's .svg cut files cut like a dream. Here is what you get in the sets. Don't forget...there is still time to join us on the Doodle Pantry Blog for this month's Ants in my Pantry Digital Challenge 2 for your chance to win a gift certificate to the Doodle Pantry store. The theme this month is CANDY. It is a digital challenge, but we also accept hand-stamped images as well. So come have some FUN! 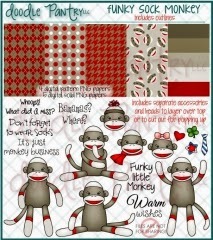 One of the new sets being released this week is called Funky Sock Monkey. Laurie has added this set to her OWH category. That means that $1.00 from each sale will be donated to Operation Write Home. Here is a link to see the other sets she has included in the OWH category. Here is what you will get in that set. This is really cute! I love all the layers! What an amazing job combining these two sets. Adorable St. Pat's creation! This is fabulous Susan. Love all the layers also and of course the BLING. Great that you combined the 2 sets for such a super result. Very striking card and the first I've seen for St Patrick's Day this year. Thanks for sharing at AAA Cards. I love both of your St. Pat's cards, Susan! Fabulous machine cutting and layering them all together to get two cards out of one cutting session. WOW! Oh, Susan, all your cards are amazing, and this one is no exception! That little bird is so cute, and I love your layout. Super cute card! Really cute and darling design. Thanks for the reminder that St. Pat's Day is right around the corner too. This is an adorable frame however our challenge this month is to create a 3d item for your craft room. You are so good and mixing and matching and the Silhouette Queen! Love all the layers and little birdie. A fabulous card! wonderful image and great colouring. thanks for joining us at stamping sensations this month and good luck! An adorable creation and such a pretty colour choice. Thanks so much for sharing your lovely work with us at Stamping Sensations challenge. Adorable card. Thank you for joining us over at the Scribble and Scrap Challenge. Good luck.